EDMOND – Northeastern State University finished two shots behind Arkansas Tech in the UCO Classic at the Golf Club of Edmond Tuesday behind Ebba Moberg who earned All-Tournament honors with a 146 (73-73) and was tied for third. Southwestern Oklahoma’s Chloe Thackeray took medalist honors carding 142 (68-74) and beat out Fort Hays State’s Hannah Perkins by three shots. Moberg has finished in the top-10 in the last three events this fall and has averaged a just over a 73 in the last seven rounds. Kelsey Lumpkin was two shots back of Moberg with a 148 (72-76) and tied for eighth place. Aitana Hernandez and Lexi Armon both were tied for 15th place with matching 151s. Nina Lee rounded out the NSU starting group with a 159 (81-78) and was tied for 36th place. Thackeray earned the individual medalist honor at the UCO Classic as she led SWOSU to a third-place finish. The third-place finish was the fourth Top 10 finish for SWOSU this season and Thackeray is the second Lady Bulldog golfer this season to win an event, joining Gloria Choi who won the NSU Classic. Thackeray took the top spot at the tournament by firing an opening-round 68, which was enough for her to hold off the field and win the tournament by three strokes over Hannah Perkins from Fort Hays State. 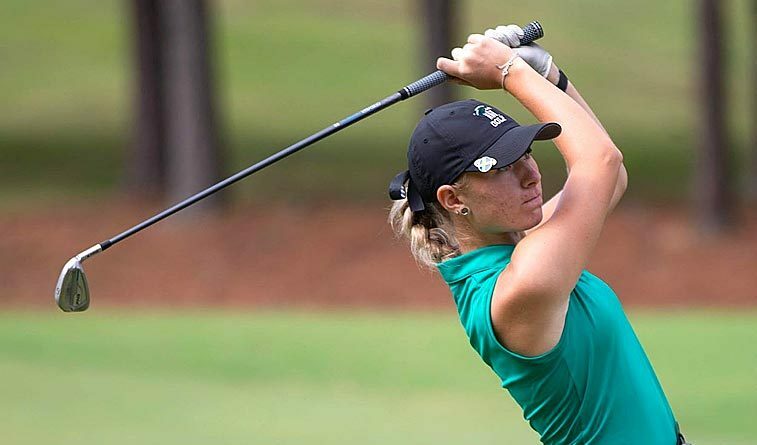 She fired a 74 in the second round, which placed her back at even par for the tournament. Elin Wahlin turned in a second-round score of 74 to finish tied for third at +4 for the tournament. Veronika de Bochdonavits recorded a 78 in the second round, which put her in 24th at +11 while Mikaela Rinderman improved her first round score by five strokes, firing a 76 on Tuesday. Gloria Choi finished both rounds of the tournament with a score of 80, placing her tied for 39th at the tournament. The Lady Bulldogs will wrap up the fall season at the NCAA Division II Central Region Preview in Muskogee, Okla. on October 16-17.